SEPTEMBER 23, 2016, CAMP DODGE, Iowa – The first female Infantry officer in the Iowa Army National Guard to “branch” infantry was commissioned recently at the Camp Dodge Joint Maneuver Training Center in Johnston, Iowa. 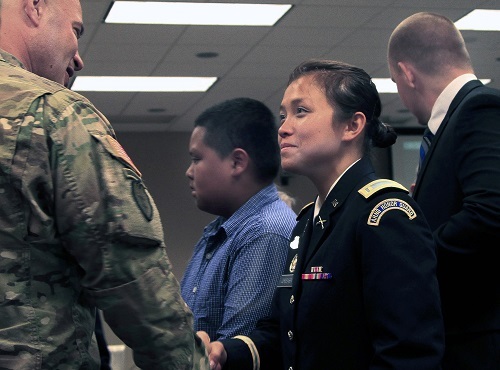 Army 2nd Lt. Trang Jorgensen, formerly an enlisted specialist with a military intelligence unit, completed Officer Candidate School this summer. 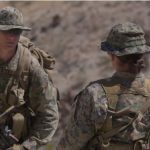 In December, Defense Secretary Ash Carter announced all gender-based restrictions in every branch of the military would be lifted. The first of these restrictions was lifted in January, just as Jorgensen began gearing up for OCS. 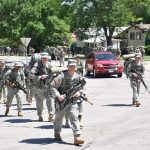 Before entering the accelerated, eight-week OCS program, she and other candidates spent time preparing at the 185th Regiment (Regional Training Institute) at Camp Dodge. Sgt. 1st Class Traci Uitdeflesch, a platoon trainer at the RTI, served as a mentor for the officer candidates prior to their departure to OCS. Jorgensen said she received nothing but positive feedback and support from both her peers and the RTI staff. For Army Col. Steve Kremer, commandant of the RTI, Jorgensen is a good fit as an infantry officer. Others in her OCS class agreed. Other cited her level headedness, ability to stay calm in high-pressure situations, humility and work ethic as traits that make her a good leader. “She’s the last one off the field trying to get something done and the first one up in the morning trying to get started,” said Army 2nd Lt. James Weltha, a classmate from OCS. Jorgensen will be assigned to the Iowa Army Guard’s Headquarters and Headquarters Company, 1st Battalion, 168th Infantry Regiment as a rifle platoon leader prior to leaving for the Infantry Basic Officer Leader Course at Fort Benning, Ga.
Jorgensen said she’s looking forward to the taking on her new role as a platoon leader.